★Wire: Three strong galvanized steel wires are woven into one wire. ★Wire gripping handle: Pass the wire through the hole in the wedge shaft. Pass it through the hole in the top of the shaft. Then return to the handle. Push the wedge back into the handle and fix the wire. ★Windshield removal tool: Cut vinyl adhesive around the windshield. ★Wire Feeder Tool: Designed for easy and flexible insertion of polyurethane through the wire, allowing quick removal of bonded windshields. ★Trim pad remover: Place the tool under the edge of the interior trim panel, insert it into the fastener as far as it will go, and simply pry it up. Dear friend, if you have any question about the product, please contact us before leaving the feedback, we will deal with the issue immediately and carefully until you are satisfied. ✅ [Applicable Vehicles]: Applicable to bonding and rubber windshields of various General Motors, Ford, Chrysler, Honda and most other domestic and imported cars and light trucks. 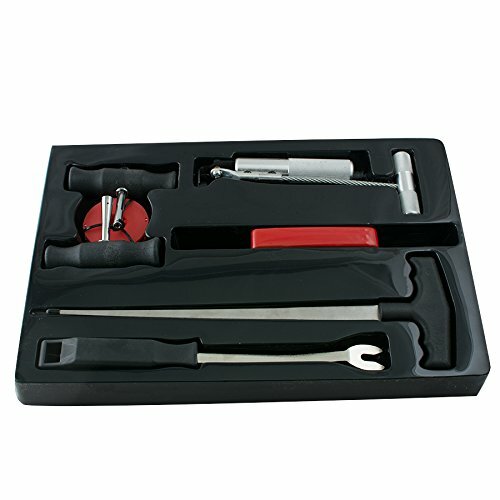 ✅ [Easy to carry]: A total of seven sets of windshield removal tools, including all the tools you need to work, and a plastic box, can be easily accommodated, whether it is in the car or at home, is very convenient. ✅ [Package]: (1) windshield cutting wire, (2) cutting wire handle, (1) double hook handle, (1) perforated cone, (1) pull-type scraper and pull rod, (1) panel with handle tool. ✅ [Transportation]: This car windshield disassembly kit is delivered directly from the US warehouse. It can be delivered in 3-5 days. If you have any questions about the product, you can contact us at any time.